It is with great sadness that the South Carolina AHEC marks the passing of Olin Marion Burton, MD. Dr. Burton was a friend and ardent supporter of AHEC, as well as a dedicated physician who sought to improve access to care for people of all ages in our state and beyond. Dr. Burton graduated from Clemson University and the Medical University of South Carolina (MUSC) and trained at MUSC and the Medical College of Georgia. He practiced pediatrics in Anderson for two decades, where he was also a faculty member with the Anderson Family Medicine Residency Training Program before being appointed as Director of Pediatric Education and Associate Director of the Residency Training Program. Dr. Burton went on to establish a Division of Community Pediatrics at the USC School of Medicine and established the South Carolina AHEC locum tenens program in 1994, where he was its Medical Director for 21 years. He also served as on the Board of the SC AHEC Rural Physician Recruitment Program where he led the charge to place providers in rural and underserved areas for 21 years, serving as Chair for the past 13 years. Dr. Burton served on the South Carolina Hospital Association Board of Trustees and as president of the South Carolina Medical Association and American Academy of Pediatrics. In addition to his medical career, Dr. Burton led a distinguished military career and retired in 2005 as Colonel in the South Carolina Army National Guard. Dr. Burton’s leadership and lasting impact on health and healthcare in South Carolina cannot easily be enumerated. 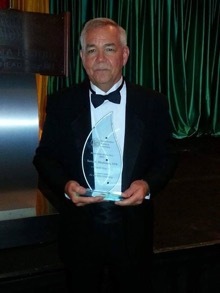 His work to establish and secure funding for the Locum Tenens program was instrumental in supporting the practices and strengthening the retention rates of family practitioners in rural South Carolina. His work with the Rural Physician Program has resulted in over 386 primary care physicians being placed in rural and underserved areas of our state. He was an integral part of the South Carolina AHEC system for all but two years of its existence and will be greatly missed. Click here to read the full obituary in The State newspaper. The annual South Carolina AHEC Resident Scholarship Symposium was held in conjunction with the South Carolina Academy of Family Physicians’ (SCAFP) annual meeting in Myrtle Beach on June 7-8. On June 7, a Chief Residents’ Seminar was held for physicians who will be chief residents during the 2015-2016 academic year. The session was conducted by Mark Greenawald, MD, Associate Dean for Student Affairs at Virginia Tech Carilion School of Medicine. That night the SCAFP and the South Carolina AHEC Family Medicine Residency Program directors sponsored a wine and cheese reception and poster session for residents, members of the South Carolina Academy of Family Physicians, and their families. Authors of 16 abstracts also presented scholarly presentations on research and quality improvement projects. Gerard Jebaily, MD (McLeod Family Medicine), and Lisa Mims, MD (Trident/MUSC Family Medicine), served as co-chairs and moderators of the Resident Scholarship Symposium. Judges were Matthew Cline, MD (AnMed Family Medicine); Melissa Hortman (Trident/MUSC Family Medicine); and Ed Evans, MD (Seneca Lakes Family Medicine). Marty Player, MD (Trident/MUSC Family Medicine), assisted with the symposium presentations and scoring. The residents’ presentations were well attended by SCAFP members who asked residents thought provoking questions and discussed how these projects translate into practice. If you would like additional information about the symposium, please contact Director of AHEC Recruitment and Student Programs Kristin Cochran at (843) 792-6977 or cochrak@musc.edu. The South Carolina AHEC is pleased to announce that Patricia Wilson Witherspoon, MD, FAAFP, is this year’s recipient of the Halford Award. Since 1998, Dr. Witherspoon has been an integral part of the Palmetto Health Family Medicine Residency Program. She is currently serving as the Co-Medical Director and Associate Professor for the USC School of Medicine Department of Family and Preventive Medicine. In these roles she has committed herself to serving her community and providing excellent medical student teaching and resident mentoring. Her experience as a leader and role model are acknowledged in the many other recognitions she has received, including the USC Social Justice Award (2011), USC Women’s Health Award (2011), and DHEC Diabetes Champion of the Year (2010). The Halford Award is presented to a Family Medicine residency training program faculty member in recognition of outstanding leadership in providing humane education. The award is named for Dr. James Halford, who was the founding director of the AnMed Health Family Medicine Residency Program. Award winners demonstrate a caring attitude and respect for patients, residents and students; value human dignity; and demonstrate a passion and joy for teaching, learning and working with others and participating in community service activities. The Sixth Annual South Carolina AHEC Excellence in Family Medicine Education Award was presented to Scott Bragg, PharmD, BCSP, with the Trident Health/MUSC Family Medicine Residency Program. Since 2013, Dr. Bragg served as assistant professor for the South Carolina College of Pharmacy Clinical Pharmacy and Outcomes Sciences as well as the MUSC Department of Family Medicine. Dr. Bragg is involved with the I3 Collaborative, a collaboration of residency programs across South Carolina, North Carolina, Virginia and Florida. In his role as assistant professor, he has taught applied health systems and clinical assessment labs to pharmacy students, interprofessional courses on transforming healthcare to interprofessional groups of students at MUSC, and diabetes management workshops as part of the MUSC Family Medicine clerkship. He has been an integral part of the development and participation in a quality improvement and research curriculum for the residency program and implemented a longitudinal pharmacotherapy curriculum in addition to specific pharmacotherapy-related objectives for each rotation. Residents who have worked with Dr. Bragg speak highly of the significant effect he has had on the program during his two years there, including his consistent dedication to family medicine, enthusiasm for teaching and the impact he has made on pharmacy students, medical students and residents. This award was established to honor a non-physician teacher for excellence in resident education, with demonstrated skills in teaching, curriculum development, mentoring, research, and leadership in education. 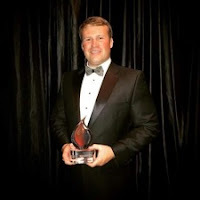 The South Carolina Pharmacy Association recently presented honors to Jarrod Tippins, PharmD, President of the Pee Dee Pharmacy Association, and Terry Blackmon, RPh, Treasurer of Pee Dee Pharmacy Association. Dr. Tippins was honored as the Distinguished Young Pharmacist for 2015 and Mr. Blackmon was honored as the South Carolina Pharamacist of the Year for 2015. Pee Dee AHEC co-sponsors monthly continuing professional education programs with the Pee Dee Pharmacy Association under the leadership of Dr. Tippins and Mr. Blackmon and congratulates them both on their honors! Duncan McDuffie joined the South Carolina AHEC Program Office team on July 13 and is assisting with the SCHOOLS network of videoconferencing systems. He graduated in May from the College of Charleston with a BS in Public Health. Most recently, he completed an internship with Coastal Connections through the Population Health Department at MUSC as a patient advocate and educator. Duncan looks forward to applying his public health background to his work at South Carolina AHEC and being a full-time Charleston resident. Welcome Duncan! He can be reached at mcduffid@musc.edu and 843-792-6222. Summer interns in the Pee Dee AHEC Health Careers Summer Internship Program have begun their summer work experiences. Students have been placed in facilities that align with their health career aspirations. This summer’s internship class includes high school and college students from Florence, Sumter, Clarendon, Horry and Marion counties. To prepare for the work experience, the interns first gathered for an orientation and training session at McLeod Regional Medical Center in Florence. The session addressed topics such as communication skills, professional appearance, and ways to optimize internship experiences. Orientation also allowed the students to meet one another and interact in person with the health careers program coordinator. 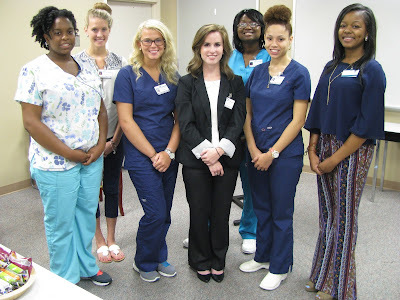 During orientation, three health professions students along with Traci Coward, Pee Dee AHEC Health Professions Student Coordinator, offered advice to the interns to help them enter their internship successfully. Traci Coward told them to “remember, the preceptors have been where you are – they were students at one point too,” encouraging the students to not be afraid to ask questions. Other tips included finding ways to integrate into the interdisciplinary team, communicating with staff, and showing engagement. Two of the health professions students: Aaron Sloan and Erin Myers were able to offer advice from a preceptor-student relationship, as Aaron Sloan is pharmacy resident and preceptor to Erin Myers. This summer’s interns have interests in surgery, nursing, pharmacy, occupational therapy, healthcare administration, human resources, optometry, pediatrics, obstetrics and gynecology, and cardiology. The interns will work through the end of July. As both an educational and work experience, interns will also participate in enrichment activities for student development and present a final project. For more information, please contact Pee Dee AHEC Health Careers Program Coordinator Larrissa Clavon at lclavon@mcleodhealth.org. The 13th Annual Research Symposium: Integrating Research with Action to Promote Health Equity will be held on September 25. The purpose of the symposium is to enable participants to identify health equity issues in research and apply findings across healthcare settings. The symposium is sponsored by Upstate AHEC, in collaboration with The Nursing Research Committee of the Greenville Health System, the Nursing Research Council of AnMed Health, Nursing Division of Greenville Technical College, Gamma Mu Chapter and Mu Rho Chapter of Sigma Theta Tau International Honor Society of Nursing. The conference will take place in the auditorium of the Technical Resource Center (Building 102) on the Barton Campus of Greenville Technical College at 506 South Pleasantburg Drive in Greenville. Speakers will include: Gayenell S. Magwood, PhD, RN; Sharon Holder, PhD, MSc, MSW; Shirley M. Timmons, PhD, RN, CNE; DeAnne K. Hilfinger Messias, PhD, RN, FAAN; M. Elizabeth Fore, PhD; Edena Meetze, DrPH, MPH, CHES; Joynelle L. Rivers, EdD, MSN, RNC; Jennifer Beecroft; Tisha M.Felder, PhD, MSW; Toshua W. Kennedy PhD, MPH, PHCNS-BC; and Julie C. Martin, MSN, DNPc, AOCN, NP. There will also be 16 poster presentations on identifying health equity issues in research and applying findings across healthcare settings. If you would like more information about the conference or have questions, please contact Bennie Pettit at bpettit@upstateahec.org or 864-349-1162. The full conference brochure will be available the end of July at www.upstateahec.org.